Bike Week NZ is a unique event on the calendar catering to motorcyclists with a sense of adventure and a thirst for fresh horizons. The dates above for our 9th year in 2020 are locked in so you can make your holiday plans to include Bike Week NZ number NINE in 2020! Registration information has not yet been updated, but feel free to use last year’s form in case you want to get in really early. Bannockburn is an historic old gold town in Central Otago, known better now for the brilliant Pinot’s produced by its many local winemakers. Called ‘The Heart of the Desert’ the small community nestles in hills overlooking the magnificent Kawarau River where it flows into the upper reaches of the Clyde Dam. Surrounded by often snow clad peaks Bannockburn is ideally situated to offer some of the very best road and off road riding in the world. Bike Week will give you the opportunity to get into places on your adventure bike that you will never forget or to take part in road rides through spectacular Southern landscapes on the emptiest highways in the country. The ninth annual Bike Week is scheduled to run between Saturday January 25th and Friday January 31st 2020. It is followed by the Vincent County Rally (31 Jan – 2 Feb) at Alexandra hosted by BRONZ Otago. FOR THE THIRD TIME, the Burt Munro Challenge will be held in February, and is the week after Bike Week. 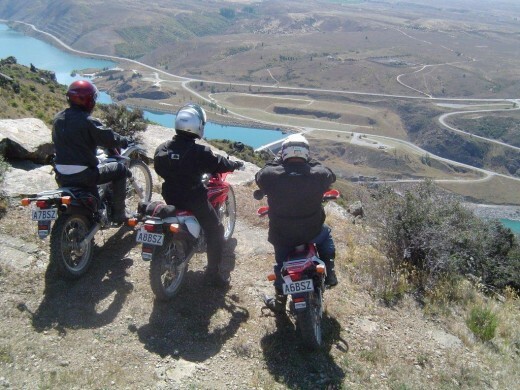 This allows those fortunate enough to take the time to attend three top South Island motorcycle events (all totally different) in just two weeks. Base Camp will be notified in August, but in Bannockburn, Central Otago. Camping and other accommodation will be available from Saturday through to Thursday inclusive.